Location: Immediately W of the Butchers' Market building. Palmer noted the first documentary record of a building on the site by 1699, and it had been divided into 2 properties by 1760. The present building probably dates from the late C18, and appears to have been designed to take some account of its divided occupation, since it incorporates a central passage, unequally dividing the ground floor. Lined-out render over brick, with slate roof and gable end brick stacks. 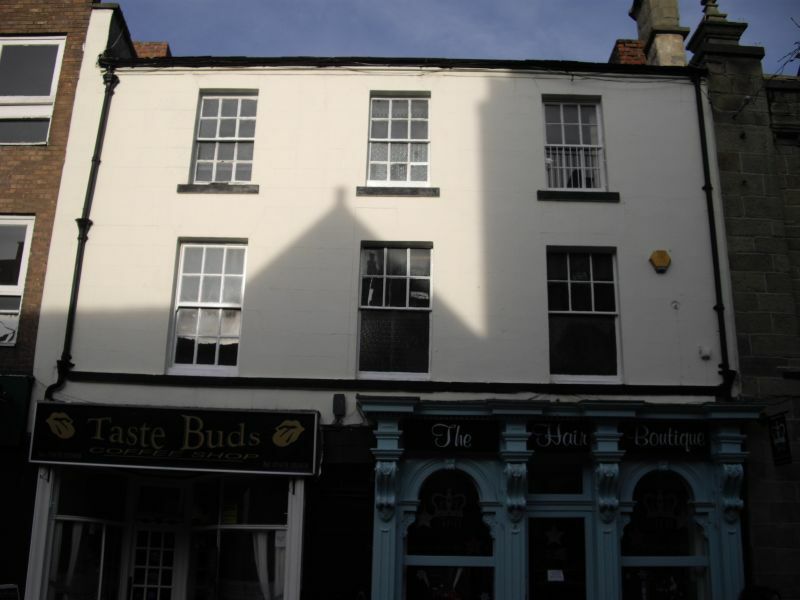 3 storeys, 3 window range with 2 shop fronts to ground floor, either side of doorway to passage. No 9 retains an early C19 shop front, its central entrance and flanking windows stressed by panelled pilasters with heavy console brackets carrying (and interupting) the fascia. Upper windows originally 12-pane sashes (some glazing bars now removed). No 9 retains some of the elements of the early C19 shop, including plaster dentilled cornice to ceiling and Palladian archway on the line of the back wall, which originally probably formed part of a display wall, but now marks a division in the opened-out floor-space. Immediately W of the Butchers' Market building. On the north side of Hope Street, linking it with the Butchers' Market. Part of a continuous building line on High Street, between the Butchers' Market and the Midland Bank building. On the corner of Hope Street and Bank Street.